I finally sat down and made the menu plan for the week. Everything listed here is from my pantry so I do not have to rush out to the store to buy anything for this week. I will save this menu and in a month or two pull it out. That way I will build up a stockpile of menus and I won’t have to reinvent the wheel. I am going to build up at least a year’s worth of menus. So that I can have a seasonal menus based on the local in-season foods. Have you inventoried your pantry yet and figured out a meal plan? Many people find financial freedom when they start batch cooking or once a month a cooking. This can save considerable money and time because you have meals in the freezer so you don’t have to worry about what eat. You are able to shop sales and save money on groceries. However that type of cooking doesn’t really work for our family. Most of the meals are casseroles, which DO NOT go over well here. Not to mention when you have a large family trying to put that much prepared food in a freezer can be a challenge. So how have I found Financial Freedom without using this valuable tool? I have a pantry and a freezer and plan my meals. I have built up my pantry to the point where I plan my meals from what I have on hand and then look for the sales to replace the used items. I do not buy meats that cost over a $1.99 a pound. I get all of them on sale and buy enough to last the family at least a month. I even keep a couple of “convenience” food items like En-Cor entrees (bought on an awesome sale) on hand so if things get totally hectic we can have a meal on the table within an hour. I plan at least one meatless meal a week. We also have breakfast for dinner at least once a month. So while Freezer Meals and Once a Month Cooking is a wonderful tool and I highly recommend using it, if you find is doesn’t work for your family you can do the same thing by stocking the components of meals so you can make meals at home. Just make sure you include things that can be made quickly so you can resist the urge to do take out on those totally crazy nights that any family can have. So head on over to Cents to Get Debt to Free to get some other great hints. People are always asking many types of the “How do you do it?” type of questions. One of the most frequent is how do we feed the family and not break the bank or have to rob a bank? When I tell them my food budget is about $700 a month they do not believe it. I am blessed to have a variety of stores around here. They all compete with one another and have great sales. One or the other is always have a 10 for $10 sale on many of the items we use. They also have wonderful sales on meats. I never pay more than $1.99 a pound for meat, usually I pay much less. Super Walmart is within 20 minutes from my door. A regular Walmart is 10 minutes away. Aldi’s is also 10 minutes from my house. I go there purchase other staples. BJs Wholesale club is within 15 minutes and they still have the best prices on milk, diaper wipes, blocks of cheese, cat litter and gas. So I pay for my annual membership with my first month’s savings. So with all these great places and sales I have built up a wonderful pantry and freezer stock. I plan my meals from what I have on hand and replenish the pantry when the items go on sale. 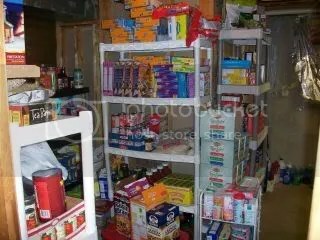 I have been asked about my pantry so here are some pictures. 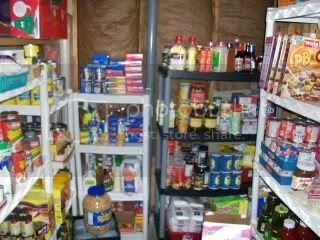 This is a good overall shot of the pantry. You can see the baking goods, spices, etc. on the back left shelf. 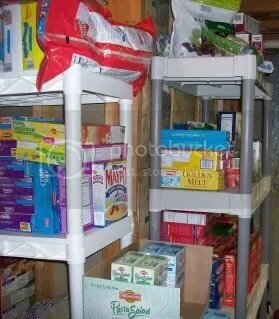 On the back right shelf is overflow from the baking goods and the shelf on against the wall on the right (canned goods). These two shelves hold my canned goods — vegetables, fruits, meats and spaghetti sauce. This shelf holds the cereal, canned milks, storage bags, and rice. On the bottom shelf I keep the big bottles of salsa, oil, syrup and ketchup. This shelf is in a bad place for getting a good picture. It holds our spaghetti, dried fruits, trail mixes, peanut butters and jellys. If you look along the back floor you can see the cleaning items. This shelf holds out frequent use items. 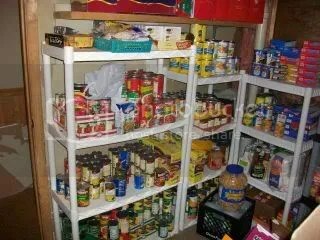 Some of the canned vegetables, egg noodles, side dishes, the children’s spaghetti O’s and ravioli and chips for lunches. Behind the doors on the left shelf are canned meats like tuna, chicken, turkey, beef and salmon. Some of the things that didn’t make it into the picture is the rolling wire rack that holds the drink mixes that the family uses like pink lemonade and Kool-aid. A bin that is full of pop tarts and a bin that holds the snack items that we keep on hand. So that is our pantry. Right now we couple eat of what we have on had for three to four months if things got really tight financially for some reason. 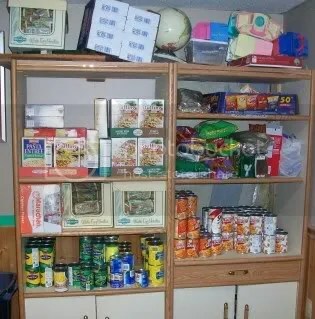 I encourage everyone to start to build up a pantry to have a buffer.